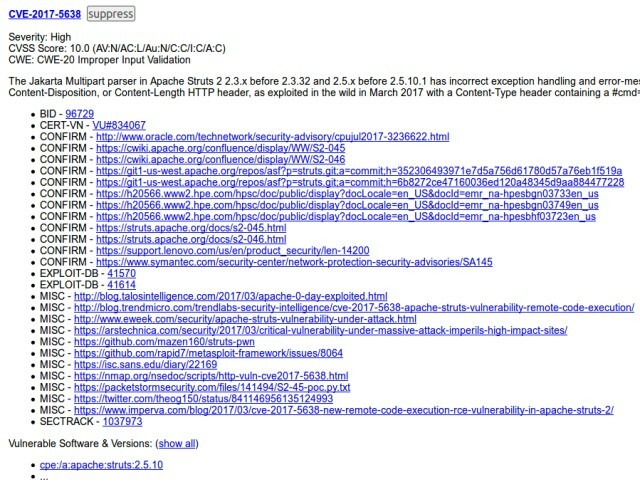 OWASP incidentally has a free tool OWASP DependencyCheck that detects the use of vulnerable components and as we shall see in this post, it also detects the vulnerability known as CVE-2017-5638 in Apache Struts2 that is the cause of Equifax's predicament. Integrating OWASP DependecyCheck in a software project built with Apache Maven is fairly straight forward, so let's dig in. 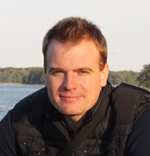 Add dependency-check-maven plugin to the project's pom.xml file. Run the plugin's check goal. The plugin downloads all the known Common Vulnerabilities and Exposures (CVE) from the National Vulnerability Database (NVD) and stores them in the Maven repository under /.m2/repository/org/owasp/dependency-check-data/3.0/dc.h2.db. It then proceeds to analyze the Maven project's dependencies. All vulnerable dependencies are listed directly in the console output. On subsequent runs the plugin will only download updates from NVD. The projects pom.xml shown previously doesn't have any dependencies other that the plugin itself. To spice things up let's add Apache Struts2 version 2.5.10 as a dependency in our project. Run the dependency checker again. So this time around the dependency checker detects multiple vulnerabilities, including CVE-2017-5638. We could google each CVE listed, but the dependency checker has already prepared a report with all the details. The report is stored in target/dependency-check-report.html. In addition to listing the vulnerable dependencies that we already saw in the output from Maven, we can see the details of each vulnerability further down the page. Try scrolling to the vulnerability CVE-2017-5638. From the description we learn that an attacker can execute code on the server by simply passing the code through the HTTP header "Content-Type". Typically an attacker would send code that starts a new shell process and link it up with a Servlet that interactively pipes commands through HTTP to the shell. Because of the ease of exploiting this vulnerability and the level of compromise, it has the highest score of 10.0 in the Common Vulnerability Scoring System (CVSS). The dependency checker detects the use of known vulnerabilities by looking for matches of the dependencies in the Maven project with the software components listed in the CVEs. This process is a little sketchy because they have different schemes for identifying software. Maven identifies dependencies using GroupId, ArtifactId and Version (GAV) and CVEs identify software using Common Platform Enumeration (CPE). Scrolling back to the list of vulnerable dependencies we find a column named CPE Confidence. This is a score of how confident the dependency checker is that it made a correct match. In the case of the Struts2-core-2.5.10.jar dependency the CPE Confidense is "Highest". To any human being reading the description it is obvious that this is indeed a match but we will often have false positives. So regardless of the CPE Confidense it is always prudent to read through the CVE description and make our own conclusions. To prevent false positives from reappearing we can suppress either the software component identified by the CPE or the individual vulnerability by clicking the Suppress button in the report and saving the XML snippet to a file in the project. The first time select the output from "Complete XML Doc". Say we stored the XML in the root of the Maven project in a file named suppressed.xml we would then configure the dependency checker to use this file using the suppressionFiles option in the pom.xml. Rather than naming the dependency checker plugin and the check goal on the commandline, we can bind the goal to a Maven build phase and wrap it in a Maven profile thats easier to remember. In this example the profile is named securitycheck. Use the -P option to activate the profile. To make sure detected vulnerabilities don't go unnoticed we could set up an automated Jenkins job to run the dependency checker regularly and configure the plugin to fail the build when vulnerabilities are detected. The following pom.xml fails on any vulnerability by setting the configuration property failBuildOnAnyVulnerability to true. Alternatively we could use the failBuildOnCVSS to fail on a CVSS score above a certain threshold.